Leah Clements, film still from Protection, 2018. Courtesy of the artist. 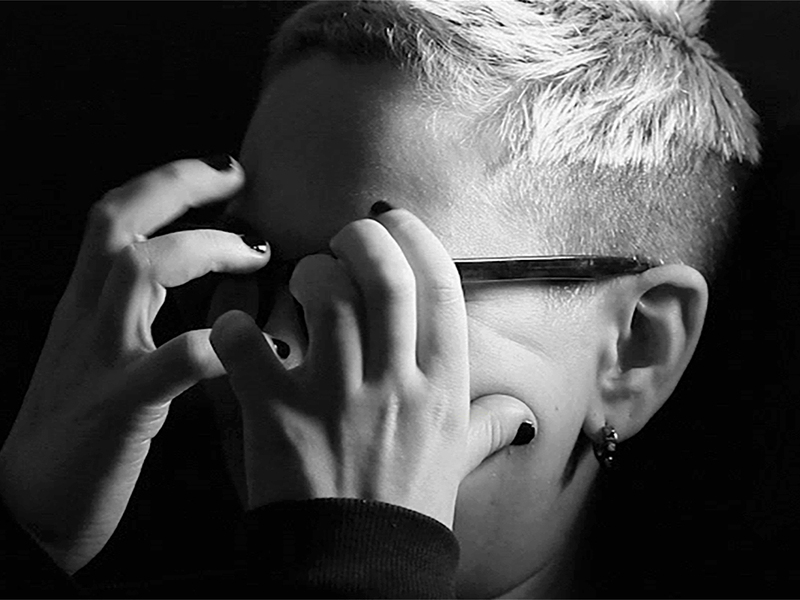 This film screening and reading marks the starting point of a project by a new crip research group, comprising art practitioners who identify as crip, disabled or otherwise non-conforming to standard ideas of good health. The group formed to develop artwork, a critical language and practical changes to working relationships within arts organisations from a ‘crip’ position. The term ‘crip’ describes a necessarily political position on illness and disability. It subscribes to the social model of disability, which states that disability is caused by the way society is organised, rather than by a person's impairment or difference, and looks at ways of removing barriers that restrict life choices for disabled people. Crip theory owes much to queer theory, taking its basis of fluidity and applying it to identities forged in sickness and unhealth. This includes disability, chronic illness, mental illness and more. Four members of the group – Leah Clements, Elena Colman, Alice Hattrick and Lizzy Rose – will present film and artworks created before this period of research and development. This presentation is a point from which to think through how their work currently deals with crip themes, and to develop this visual and critical language. Using In formation III as a platform to explore how best the group can work together, this also marks the beginning of a supportive exchange with the institution. The crip research group will further advance their work while in residence at Wysing Arts Centre in October. This is a relaxed event. This means that if you tic, shout or move about, you’re more than welcome. The crip research group comprises art practitioners who identify as crip, disabled or otherwise non-conforming to standard ideas of good health. The group was formed by Leah Clements with members Uma Breakdown, Rebecca Bligh, Elena Colman, Alice Hattrick and Lizzy Rose. Leah Clements is an artist based in London. Her practice is concerned with emotional experiences; the relationship between the psychological and the physical; and self-loss. Recent work includes a residency at Rupert, Vilnius; Sick Bed, SPACE Art + Technology residency; The Empath Project, Res (all 2018); we felt the presence of someone else, Jupiter Woods (2016); Beside, Chisenhale Gallery (2015–16); and You Promised Me Poems, Vitrine (2015). Lizzy Rose lives and works in Margate, UK. Her work work spans video, photography, ceramics, drawing, writing, curating and online blogging. She broadly explores community, landscape, British identity and hidden culture. Lizzy Rose has a severe form of Crohns disease which impacts her daily life. She has spent the last 12 months in hospital, documented through Instagram. Lizzy Rose is an Associate Member of Open School East 2017. She graduated from BA Fine Art at Central Saint Martins College of Art and Design in 2010. Rose worked with Matthew de Pulford and Paul Hazelton at LIMBO, an artist-led project space, from 2013-2015 and recently she has contributed to the programming team at Crate in Margate. Elena Colman is an artist based in London. Her practice explores the creation of temporary social spaces in order to explore concepts such as work-life balance, behavioral ethics in dating and what it means to break the binary of private and public life. She is the founder of Ladette Space, a DIY project space in her flat which ran from 2014–17 and continues as a publishing house. Alice Hattrick writes essays and criticism about art, scent, family ties and health. She is currently working on her first non-fiction book on the subject of gendered illness and mother-daughter relationships, titled Ill Feelings.